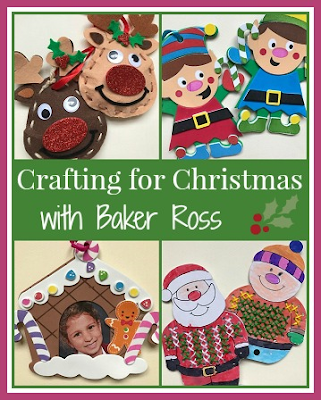 I love crafting with the children at Christmas, both making decorations for the home and as a way to calm down when the excitement gets a little bit too much! Baker Ross have some fantastic craft kits this Christmas, which are great do do with your own children, to keep on standby for play dates, or if you are looking for an activity to keep a larger group of children happy. The children each have a Christmas tree in their own room and they love to fill it with decorations that they have made themselves. These Christmas Elf Mix and Match Decoration Kits are really easy to put together and are a lovely bright and cheerful addition to the tree. All the pieces are self-adhesive, so there is no glue needed and no mess. We also each sewed a reindeer ornament from this Rudolph Reindeer Decoration Sewing Kits. The sewing is very simple, and then the decoration is stuffed and personalised with self-adhesive stickers and googly eyes. They are very sweet and cheerful! To decorate our front window, the children coloured in some of these Christmas Bauble Colour-in Window Decorations. You just need felt pens to colour in these see through designs, and if you use nice bright colours they look lovely with the light shining through. Christmas is a time for giving, and friends and family love to receive handcrafted gifts from the children. I really like these Christmas Pals Cross Stitch Cards, the children have worked really hard on them and they are a lovely keepsake. A Gingerbread House Photo Frame is also a lovely gift when completed with a photo of the child or perhaps a drawing. The self-adhesive foam shapes are easy to stick together with no mess, and can be customised however the child likes. 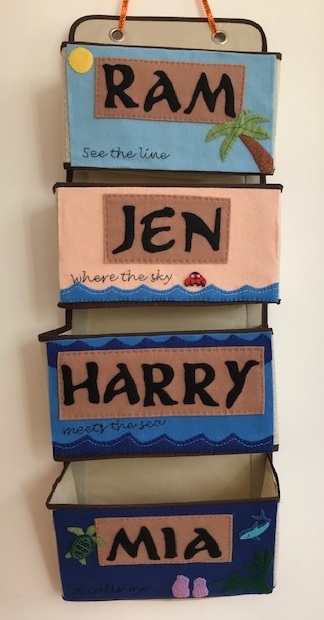 They can be hung on the tree, or you could also attach a magnet to the back to display on the fridge.